Eight-time champion Rafael Nadal made amends for last year's defeat by Nicolas Almagro with victory over his fellow Spaniard in round two of the Barcelona Open. Nadal, who had a bye in the first round, won 6-3 6-1 to make up for his loss in the 2014 quarter-finals. He goes on to face 13th seed Fabio Fognini of Italy, who beat Russian qualifier Andrey Rublev 3-6 6-4 6-1. US Open champion Marin Cilic lost 6-4 6-4 to Victor Estrella Burgos. Fourth seed Cilic was playing only his third tournament of the season after recovering from a shoulder injury, and said: "I was not too happy with the way I played. "I made a lot of unforced errors. I feel I still need several matches to get my form to a good stage." 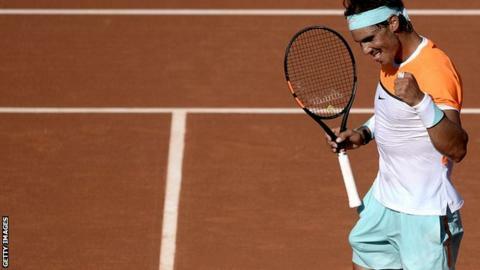 Nadal, 28, broke serve five times as he comfortably saw off Almagro, who is battling back after foot surgery. "I had today's match more or less under control and I think I made very few errors," said Nadal, the second seed. "It was the first match of the week against someone who beat me last year and for whom I have maximum respect." Spain's third seed David Ferrer brushed aside compatriot Albert Montanes 6-2 6-3, while Sweden's Elias Ymer upset Wimbledon quarter-finalist - and fellow 19-year-old - Nick Kyrgios 2-6 7-5 7-6 (8-6). Top seed Kei Nishikori plays Santiago Giraldo in the third round on Thursday. Is your club going to cut season ticket prices? Read more on Is your club going to cut season ticket prices?